Prominent global Smart City solution provider to moderate discussions on transforming core city services with a smart IoT platform, and how cities use smart solutions to add value and enhance communities. Join Bigbelly, the world leading Smart City Solutions Provider specializing in smart waste and recycling systems, this week at the IoT Solutions World Congress happening from October 3-5 in Barcelona, Spain. The IoT Solutions World Congress is the leading international event that links the Internet of Things with the industrial enterprise. More than 10,000 visitors, 250+ speakers and over 220 organizations from around the world will gather to exhibit and participate. Bigbelly will be moderating and participating in three panel discussions on the role smart solutions play in transforming core services in today’s urban environments. In addition, a representative from Dublin City Council will lead a session to share the lessons learned in deploying Bigbelly’s IoT technology platform across the Irish community of Dun Laoghaire Rathdown Council. 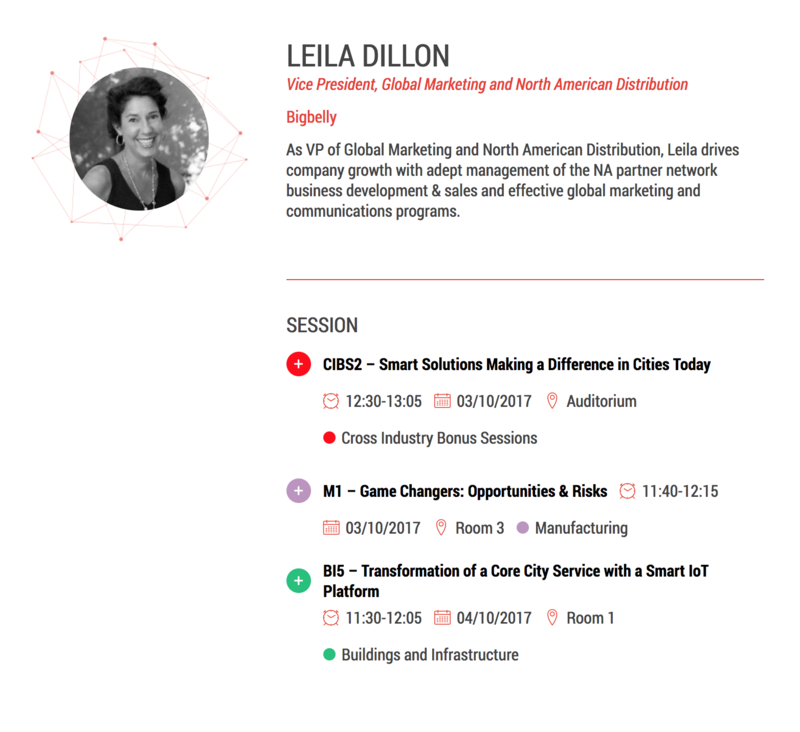 Leila Dillon, VP of Marketing and NA Distribution at Bigbelly and an experienced IoT business strategist and thought-provoking communicator, returns to the IoTSWC stage. She has previously participated as a leading panelist and session lead who discussed the technological and business impact of deploying a IoT platform on a global scale. Leila returns this year as a dual panel moderator, panelist, and member of the IOTSWC Program Committee. To kickstart the conversation, Leila speaks in the Game Changers: Opportunities & Risks panel discussion being held Tuesday, October 3 at 11:40 - 12:15 pm in Room 3. This industry-leading discussion is moderated by Accenture with panelists from Bigbelly, Thyssenkrupp Elevator Innovation Center, and PAC Research. Next up, move to the Auditorium from 12:30pm - 1:05pm for a discussion on Smart Solutions Making a Difference in Cities Today. Leila Dillon moderates this conversation with panelists from Google, Nokia, and Wind River (an Intel company) to dive into real world IoT solutions deployed around the world today. Starting at 11:30 am on Wednesday, October 5... Save your seat in Room 1 for the Buildings & Infrastructure congress track. We have back-to-back sessions that dive into a proven, IoT platform that is empowering cities worldwide to modernize public space waste management for measurable savings and community impact. Join Bigbelly's Leila Dillon in Room 1 at 11:30 am as she moderates a discussion on the Transformation of a Core City Service with a Smart IoT Platform. We are joined on stage by representatives and city officials from the cities of Antwerp, Dublin / Dun Laoghaire Rathdown Council, and Stockholm. We will talk about the implementation, application, and success of a smart waste management platform in these communities and how they are leveraging this smart city platform for both their operations today and planning for tomorrow. Remain in Room 1 at 12:15 for a deep dive into the story of An Innovative Solution for Waste Collection in Ireland as presented by Richard Shakespeare, currently the Assistant Chief Executive for Dublin City Council and formerly Director for Dun Laoghaire Rathdown County Council. Richard will be exploring the lessons learned, path followed, and motivations behind deploying a smart IoT technology platform for waste management in a suburb community of Dublin, Ireland. Will you be at IOTSWC? We would love to meet you there! 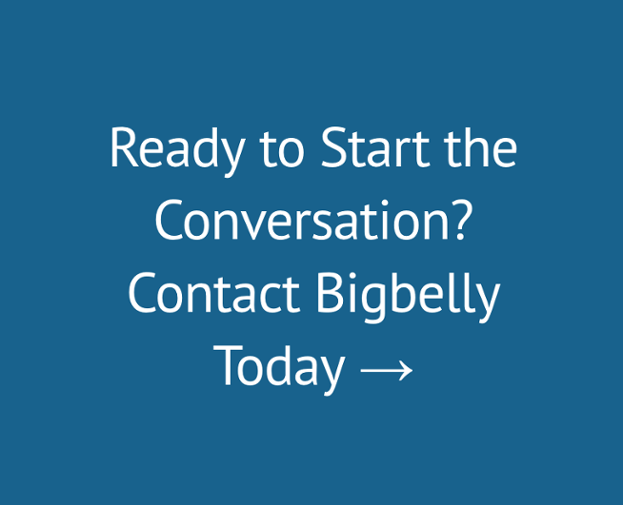 Leila Dillon is available for one-on-one briefings to discuss how to leverage the Bigbelly platform to modernize core waste and recycling services and how the platform can provide extended value by hosting Smart City technologies. Please contact Lauren Curley to schedule a meeting on-site at IOTSWC: lauren@straight-linepr.com or +1-617-529-6463.